How to Build a Vertical Vegetable Garden? If you are short on space or you want to grow vegetable gardens in a stylish manner, constructing a vertical vegetable garden for your needs might be the best way to go about it. A vertical vegetable garden can help make the most of little space; all you need do is learn how to construct them. 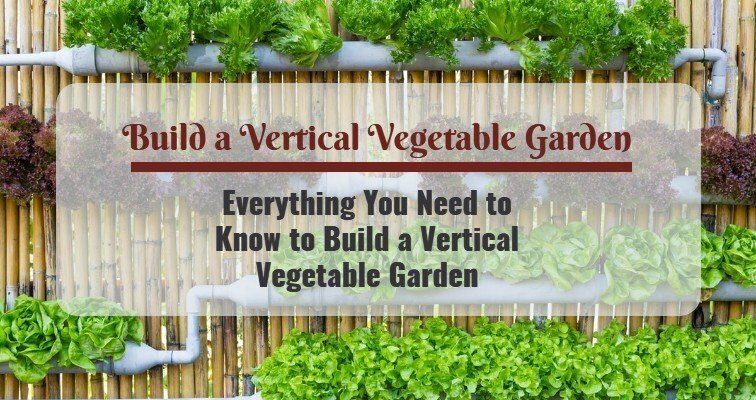 What is a Vertical Vegetable Garden? 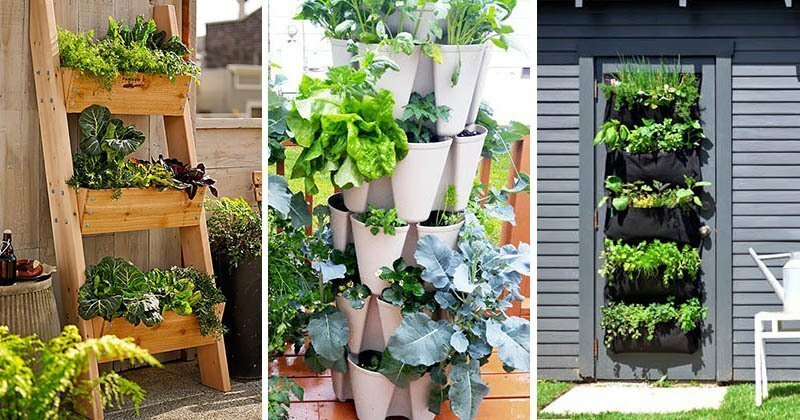 Vertical vegetable garden is a practice of growing vegetables upwards to create an elaborate structure that is supported by a background frame or shelve. This practice is popular among gardeners to save up on space. Outside space, vertical gardens can be grown for decorative purposes too. Wooden metal trellises, pots, cups, decorative shelves, garden hoses, containers and baskets all fashioned in innovative ways to create stunning looking gardens. Best suited in urban centers that have limited space with homes close to each other. Most people are scared of constructing a vertical vegetable garden with vague reasons of complexities in construction and scarce materials. The plain truth is that making a vertical garden to suit your needs is easy. If you have limited space, give vertical vegetable gardens some serious consideration. You can easily train up some of the space draining vegetables in the garden to grow upwards rather than sideways. This process of training plants to grow upwards rather than sideways only takes up about one-tenth the space they would normally cover. Start with what you already have in the house or around the garden to plan a vertical vegetable garden. Those empty pots, patios and watering cans lying around can quickly serve as a support base for a vegetable garden. Because the garden will grow upwards, it’s important that you locate it in an area close to water. A lot of vegetables can grow vertically; herbs, pole beans, cucumbers, tomatoes, cherry, and plums are all examples of plants that can grow vertically. Follow the laid down steps below to put together a nice looking vegetable garden. Preparing your pallet is one of the most important aspects of this DIY project. The pallet forms the support base unto which your plants will stand and grow. Using the sandpaper clean out all rough edges and patches from the pallet. Next, nail the thick MDF to the back of the pallet using 12-inch nails. The MDF will prevent the soils from falling off the back of the pallet. After you have done this, fill the pallet with soil. Press the soil down to make it stick firmly making such there is enough room for planting. Now that you have your pallet properly prepared for planting, go ahead and plant your vegetables. Work your way from the bottom to the top ensuring that each plant is tightly fitted in with appropriate spacing. After planting, water the plants immediately so that they quickly adapt to the new environment. Leave the plants sitting horizontally for about two weeks so that the plants can grow some roots and acclimatize to the new soil environment. Finally, stand the pallet vertically and place in a suitable space with lots of sunlight and easy access to water. Vertical vegetable gardens can help you save space. There is better air circulation in a vertical vegetable garden than there is in a regular horizontal garden. Constructing a vertical vegetable garden keeps the vegetables off the ground which will in turn prevent molds, air-borne diseases and crawling insects. Your workload is cut in half when it’s time for harvest. It’s easier to harvest the fruits and leaves of a vertical vegetable garden than form the regular floor garden. Important to your success is an adequate location for your vertical vegetable garden. Although you can grow your upright garden at the balcony, deck or patio make sure there is an abundance of sunlight reaching the plants. It’s imperative that your plants get a lot of sunlight because most vegetables need a minimum of 6 hours sunlight exposure per day to grow healthy. Just as we have discussed earlier, because your garden is standing vertically, makes it harder to water. So try as much as possible to locate the garden close to a water source. You can also use expandable garden hoses to help you in this situation. Lastly, try to make sure you construct your vertical garden in such a way that the vegetables face south enabling them to have the most exposure to sunlight. There are numerous ways and styles to grow vertical vegetable gardens; we haven’t even scathed the surface yet. Vertical gardening is a lot more superior to row gardening in some ways. Do your research to find out what suits your needs. Give vertical gardening some consideration if you grow lots of climbing plants like those listed earlier. Garden Soil: How to Prepare Garden Soil for Planting? Growing up in Ventura, California famous for it's rich gardens. Brice has spent most of his life trying to help make the world greener. Studying Botany at CSRA, he's made it a lifelong passion to greenify every home. How to fix Garden Hose Kinks? How to Clean a Garden Hose?